Do you remember that box or hole above the fireplace where your old heavy 26″ or 32″ box TV rested forever until you got a flat screen TV? 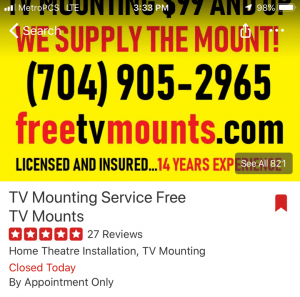 We have been installing TVs so long that we used to dismount and replace those big box TVs with new flat screen TVs on a regular basis. Now that hole is commonly called a “Nook” or “Niche”. 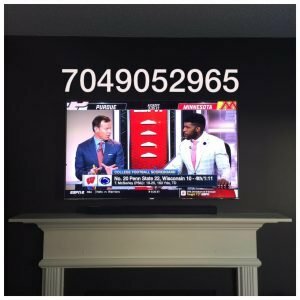 Mounting TVs over the fireplace has become one of the most popular trends in TV installation because it serves 2 purposes. Mounting your TV over the fireplace allows you to situate your furniture as needed and open up any family room or living room. 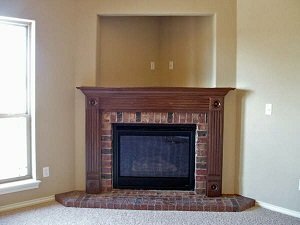 It also helps you save space and regain the fireplace as the focus point in your room. 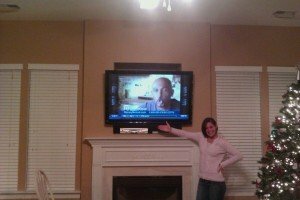 We have seen nook and niche TV mounting projects approached in several ways. 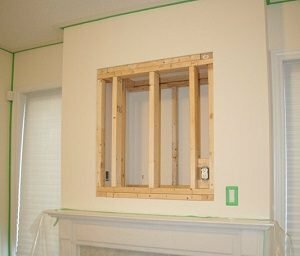 Most of our customers that have had their TVs installed by another installer have been overcharged for framing and adding unnecessary studs to their fireplace nook. We have seen large unsightly wooden studs sticking out from behind the TV and expensive unnecessary wooden frames that costs hundreds of dollars. Our approach to mounting TVs over the fireplace nook and niche is the same as all of our TV installations. If it’s hard or expensive, there has to be a better way. Keep it simple and affordable by finding the right hardware. 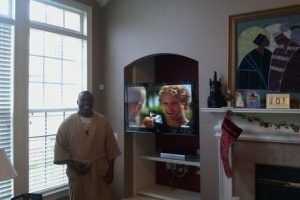 After studying hundreds of fireplace nooks and niches in the Charlotte NC area, we discovered that all you need is the correct wall mount and the correct TV installer. 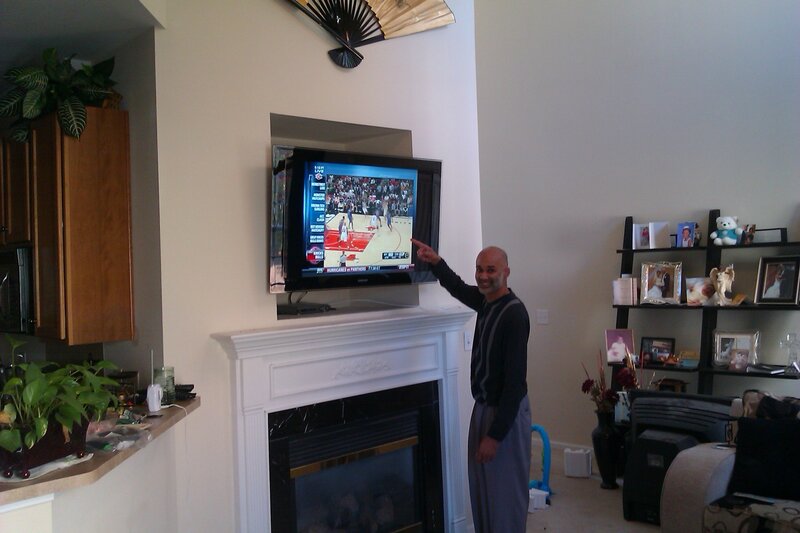 Therefore, we hired a TV mount manufacturer overseas to create and import our own fireplace nook and niche TV mount with a custom articulating arm that extends up to 24 inches. 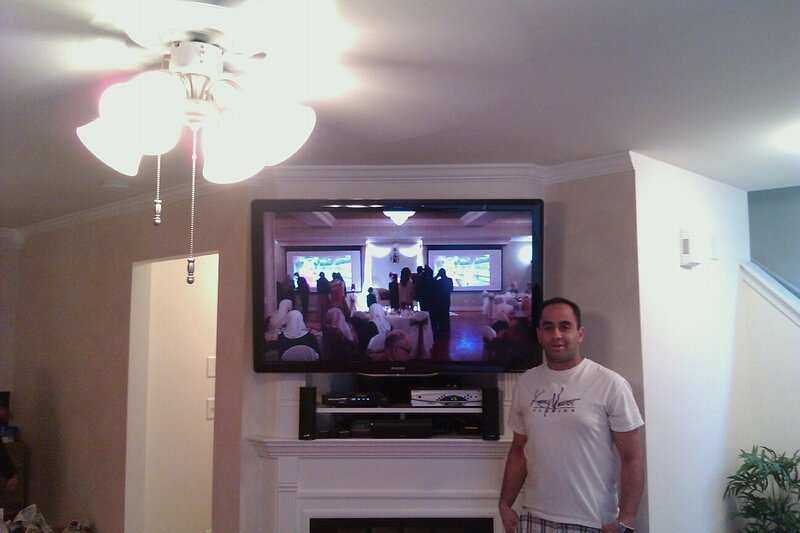 Our custom nook and niche TV mount supports any size TV up to 75″ and 110 lbs. 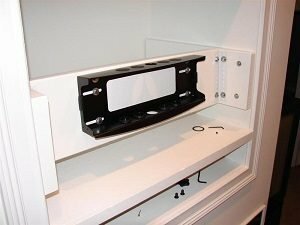 It is specially designed for TV mounting inside fireplace nooks and niches, as well as other custom installations requiring extended arm TV mounts. Most standard niches are about 24 inches deep maximum. 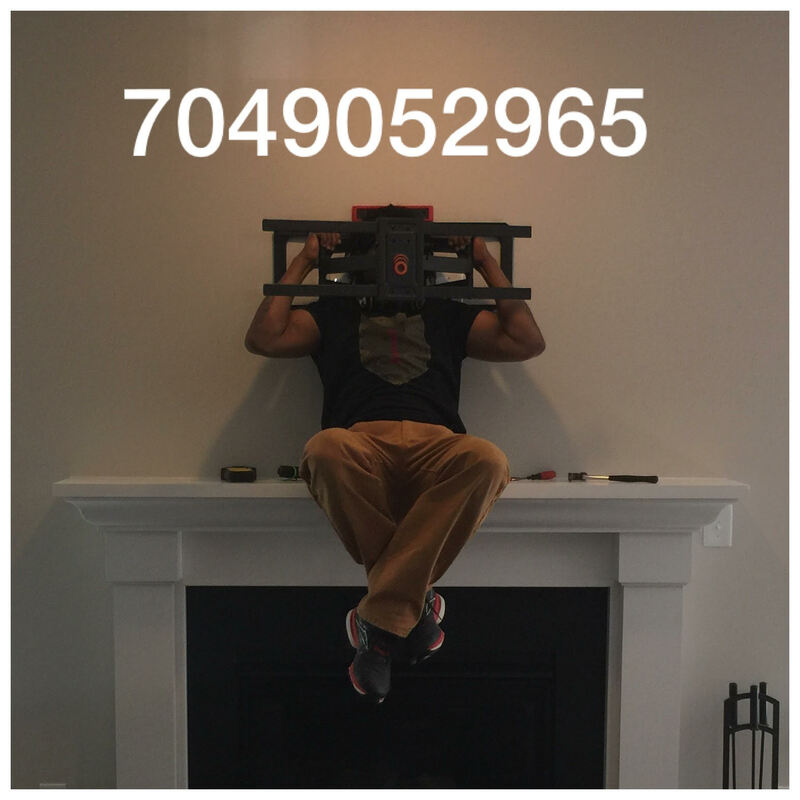 Amazon sells a single arm mount that extends up to 24 inches that is perfect for fireplace nooks and niches. 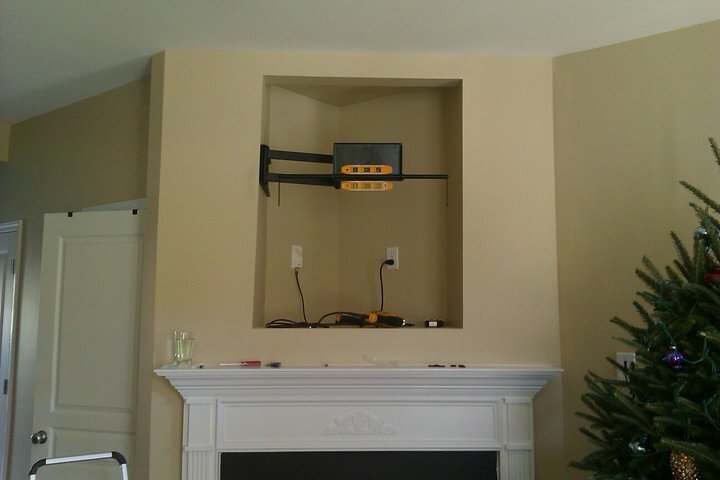 However, we recommend using only dual arm mounts for TVs over 50 lbs. 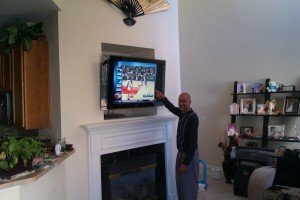 All devices and components connected to the TV will stay inside the nook or niche but we ensure your remotes are still able to control your cable box and other devices. Mounting the TV above the components inside the nook guarantees that you won’t see all of the unsightly wires and cords behind and underneath the TV. To give you an idea of the weight distribution hold a 5 pound weight in your hand close to your body. Now hold the same weight with your arm extended. The TV mount’s mounting arm stays extended the whole time so putting the proper lag bolts in the center of the stud is mandatory to avoid the TV mount eventually pulling out from the studs and falling later. 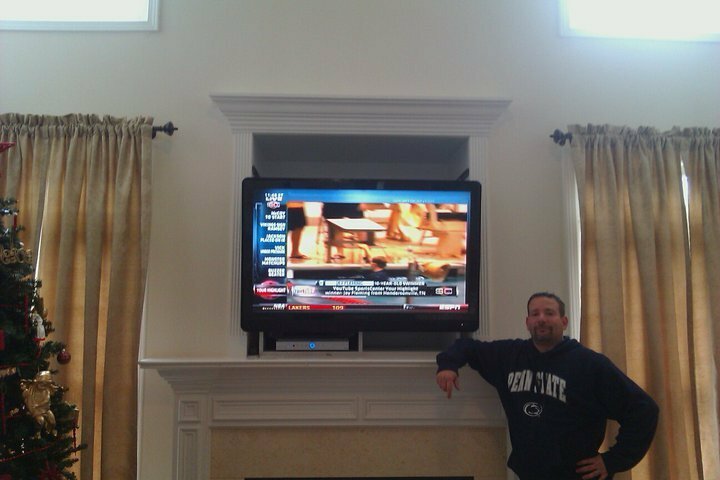 We suggest hiring a professional TV installer to ensure your TV is properly installed using the studs your builder has supplied. Visit our picture gallery to see more photos.